The accordion is a versatile and complex instrument, so it helps if you know how it works and what’s inside. This alphabetical series continues with more in-depth information on a variety of interesting topics. Diatonic accordions have notes fitted for only one or two musical keys. They have button keyboards and usually play a different note for each bellows direction. This minimises size, weight, and cost but forces frequent changes in bellows direction. While adding ‘bounce’ to folk dance music, this complicates playing and makes the instrument less attractive for some other types of music. 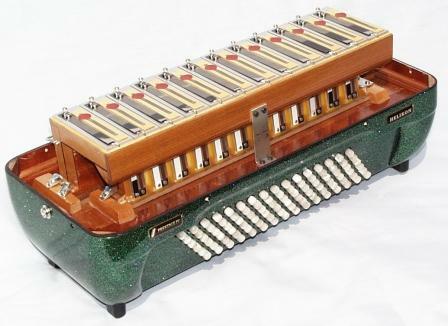 Melodeons are diatonic accordions and so are many other small folk instruments specially adapted to the folk music of particular cultures and localities. The example shown in the photograph is made by Fratelli Alessandrini of Castelfidardo. An ‘eight-foot’ reed in an accordion sounds silly, but in fact the term originates from organ technology and is merely an alternative name for the ‘clarinet’, or mid-range reeds. Organ pipes twice as long have half the pitch, and vice versa, so the bassoon reeds on the accordion are also known as ‘16ft reeds’ and the piccolo reeds as ‘4ft reeds’. When an accordion is not being played it is quite vulnerable to damage. It is best to fasten the bellows straps and then stand it on the four feet that are fitted to the bass section. Routine storage in this position also ensures that the valves on the reeds do not flop sideways and lose their flatness. In the Stradella system, pressing a bass button plays the note in all available octaves at once and the individual notes are not accessible individually. Free bass systems remove this limitation to give a bass keyboard with a similar range to that of the right-hand keyboard. As a result two-handed music written for piano or organ can be played on a free bass accordion without alteration. Some free bass accordions do away with the Stradella layout altogether. Others have a ‘convertor’ switch that switches the buttons between Stradella and free bass layouts. Yet others add extra rows of buttons above the normal Stradella buttons. The extra mechanical complexity in the latter two cases tends to increase the size and weight significantly. Musette or Tremolo Tuning with detuning by 20 cents or more is called French tuning. Traditionally the Scots and the Irish also like a similar or even greater amount. The grille is a perforated cover that fits over the treble mechanism. Often it is highly decorated, with a pattern of perforations characteristic of the manufacturer – rather like car radiators are to cars. The degree of perforation in the grille has an effect on the sound quality and the loudness of the treble reeds. 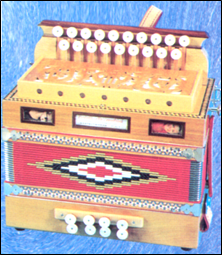 Some accordions are fitted with movable dampers to vary the size of the effective opening. This is a soft, padded, accordion case fitted with shoulder straps like a rucksack. Many people find it is easier to carry the instrument around in a gig-bag than in the standard hard case. Designs vary and some are more comfortable to carry than others. technically superior to normal machine-made reeds (‘voci a macchina’) in three important ways: air-gap tolerances are finer, riveting is more precise, and higher grade materials are used. In use they tend to be more responsive. They sound louder for a given air supply and start quicker. Also the exact pitch is less affected by how loudly they are played. Helikon reeds are much larger than normal reeds for a given pitch. They differ from normal bass reeds in not relying on a brass weight soldered onto the end of the reed to make them vibrate at a low enough pitch. Used for the lowest octave in the bass section of an accordion, they give a much stronger and richer bass sound than normal reeds. The reason is that the increased vibrating surface area moves a greater volume of air, and this enhances the level of the fundamental bass note relative to the harmonics that are also generated. (Just as ‘woofers’ give more bass than ‘tweeters’ in Hi-Fi systems). 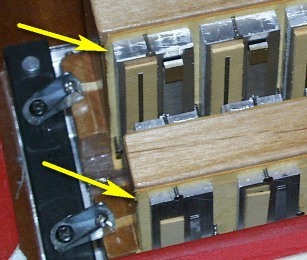 The photographs show the Helikon reeds in the lowest bass octave of a Beltuna Prestige IV Helikon model. 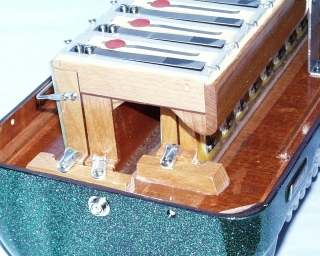 Notice that the reeds are fixed to the reed plate with screws instead of rivets. Musette or Tremolo Tuning with detuning by about 18-20 cents is known as Italian tuning. To those English ears that are not attuned to folk music, Italian tuning probably verges on the upper limit of acceptability. Some manufacturers now finish their accordions with special polyurethane lacquer instead of celluloid. Resin and hardener chemicals are mixed and applied by spray gun. The material then polymerises into a very hard surface. Several separate layers are applied and then buffed to a very high gloss. Many attractive colours and finishes are possible including sparkling metallic colours and multi-coloured effects. The master coupler is the one that selects all available treble voices at once. Pressing the master coupler is equivalent to ‘pulling out all the stops’ on the organ. A ‘musette’ was a traditional French bellows-operated bagpipe that tended to drift out of tune easily, as do the Northumbrian pipes today. In accordion terms it refers to the characteristically French accordion sound produced when three sets of closely tuned reeds play simultaneously. One set is tuned to pitch, one set is detuned sharp by about 20 cents, and the third is detuned flat by the same amount. The three reeds blend together and sound like a single tone played at correct pitch but with tremolo – that is, its amplitude trembles up and down. The beat rate is proportional to the amount of detuning. As well as having clarinet reeds (8ft reeds) fitted in the treble an ‘octave-tuned’ accordion also has bassoon reeds (16ft reeds) which are an octave lower. ‘Double octave tuning’ means that, in addition, piccolo reeds (4ft reeds) which are an octave higher are also fitted. A pallet is a small pad which acts as a valve to open or close the air supply to a particular reed or reed pair. It is normally faced with soft leather to produce an airtight seal when pressed onto a flat surface. The body of the pallet is usually made of wood or plastic and may be fixed to the actuating lever using the same hard wax (known as ‘cera wax’) used for fixing reeds to reed blocks. Removing the decorative grille above the treble keyboard exposes the treble pallets to view. Bass pallets are not so easy to see as they are hidden beneath all the mechanism in the bass section. A chromatic accordion fitted with a piano-style keyboard for the treble section. The direction of the bellows does not affect the note played. Normally reed plates are fastened to the reed blocks with ‘cera’, a hard kind of beeswax. This is poured into place and makes a removable airtight cement. An alternative fixing method, favoured in France, is to nail or ‘pin’ the reed plates into position. A layer of soft leather ensures an airtight seal. This process is more expensive than using wax but makes the accordion less susceptible to high temperatures. 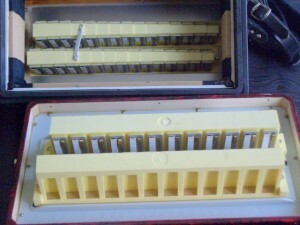 The photograph shows bass reeds pinned onto leather in a Cooperfisa 72-bass. Reed blocks for pinning are made of a hardwood such as alder instead of pine so that the pins hold in properly and to avoid splitting. However the heavier wood and the pins can add half a kilo extra to the weight of a 72 bass, 3/4-voice instrument. Traditionally accordions are made mostly of wood. But if they were manufactured in high enough quantities to offset tooling costs it seems likely that plastic materials would replace most of the wood to reduce labour costs and weight. Currently, bass buttons and treble buttons on button accordions are almost always plastic. Valve pallets are often plastic. Plastic piano keys appear on low-cost accordions but encounter some adverse prejudice. At least in its smaller accordions Weltmeister in Germany uses a modular plastic bass mechanism which is unusually light and shock resistant together with plastic reed blocks. The ventilos, or valve flaps fitted to reeds, used to be made from a special grade of leather but almost all are now made of mylar because of its superior stability and reproducibility. The outer shell of an accordion is a natural application for plastic materials because complex shapes require little extra labour but again tooling costs come into play. Cavagnola in France have used carbon fibre composite for some body shells and Beltuna in Italy are using high-density polyethylene, which combines strength with good acoustic properties, for the outer body shells in their Studio range.